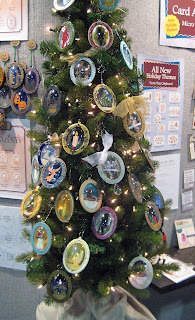 Have you seen all the NEW ornaments that were released at CHA? They are awesome. 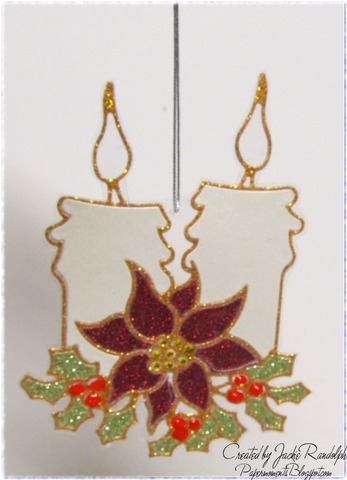 Each ornament comes with two globes and 3 rings. 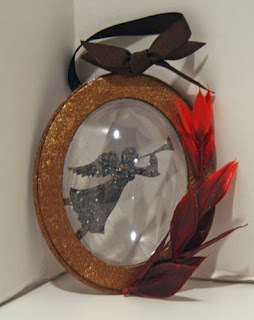 I kept the ornament simple by embossing the angel and the ring, but there are so many other things you can do. This Trumpet Angel Ornament was covered with Temple Stone Powder and heat set 3 times. 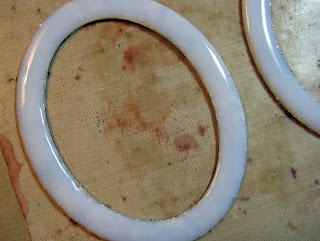 The outer rings were covered with Gilded Rose Powder and also heat set 3 times. 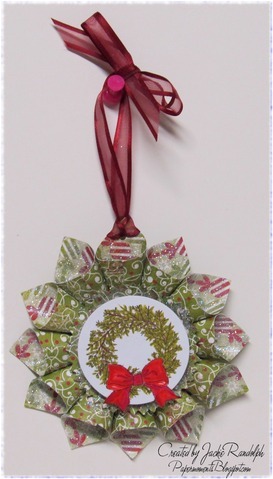 A brown ribbon finishes the top and is perfect for hanging on your tree or anywhere in your home. I added a sprig of red leaves for some splash of color around one side of the globe. It added just the right touch of color to set off the copper tones in the globeframe. 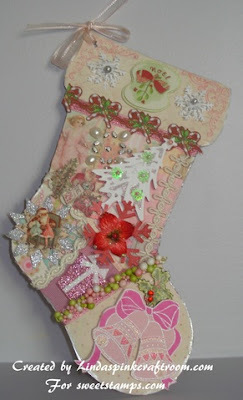 Don't forget to check back often and see what the team has been creating with these ornaments! What would you do with this angel ornament to make it shine? We'd like to see what you create, so come join in the fun! Remember to use a SweetStamps image on your creation to get an extra chance at winning $20 of rubber stamps from SweetStamps.com. Rules are listed in the sidebar and instructions can be found at the bottom of this post. July 31st is the LAST DAY of the Christmas In July Sale at SweetStamps.com's online store! 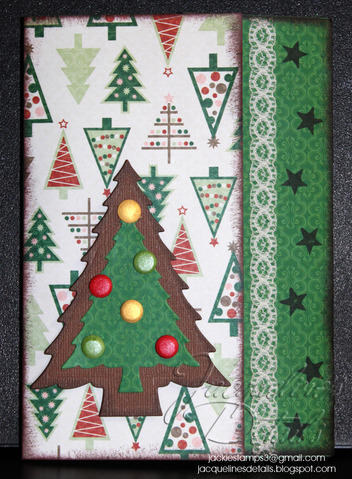 Use coupon code JULY25 to get the 25% off discount on all things Christmas. July 31st is also the LAST DAY of our SAVE THE BUS sale...get 20% off everything in stock at our warehouse when you use coupon code BUMMER. 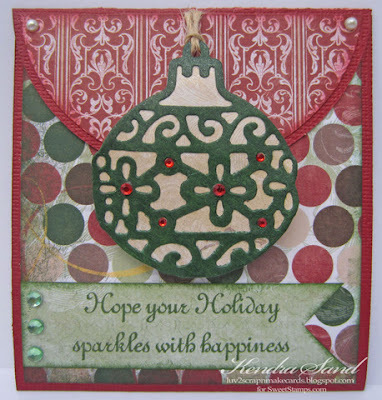 Next week our challenge theme is Stamped Background, so stop by and see what the design team has created. Hey all! Ryann here with some ways to snazzy up the Bubble Frame Kits. 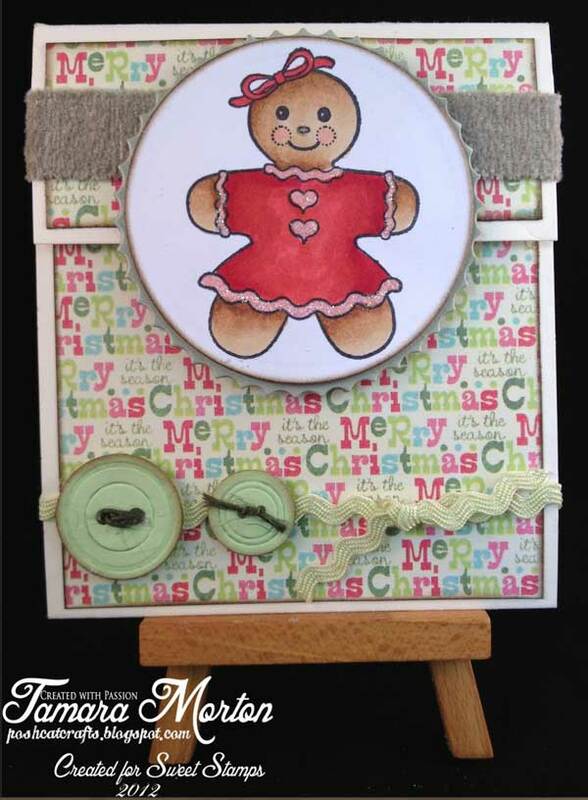 I recently received the Cupcake Bubble Frame Kit and thought it was really cute! How fun would it be to use as place cards at a birthday party labeling out the different goodies on the treat table! So fun!! 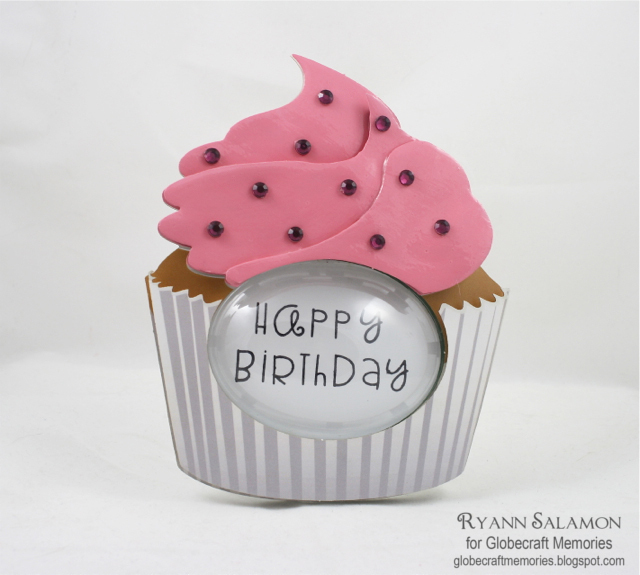 For my project today, I assembled the Cupcake Bubble Frame Kit as directed, except for the frosting bits. 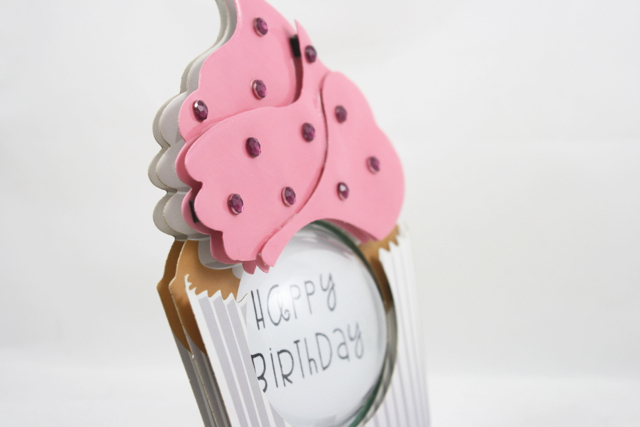 Instead of placing a picture in the the frame, I opted for a Happy Birthday sentiment instead. It was easy to stamp the sentiment and then place into the frame. After I had assembled the Cupcake Bubble Frame Kit I decorated it! 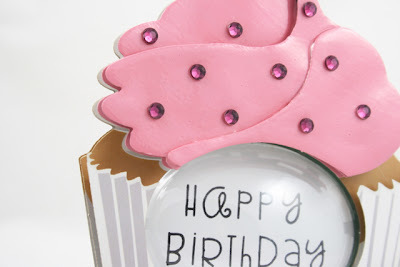 I started by painting the frosting a light pink using acrylic paint. It took two coats to get good coverage. After the paint was dry, I popped up the frosting pieces using the dimensional adhesive provided in the Cupcake Bubble Frame Kit. You can see from my picture above the dimension in this project! Once the frosting was assembled and adhered down, I applied a thin layer of Glastique for some added shine. And then once the Glastique was dry I generously applied some bling!! I love the way this turned out! 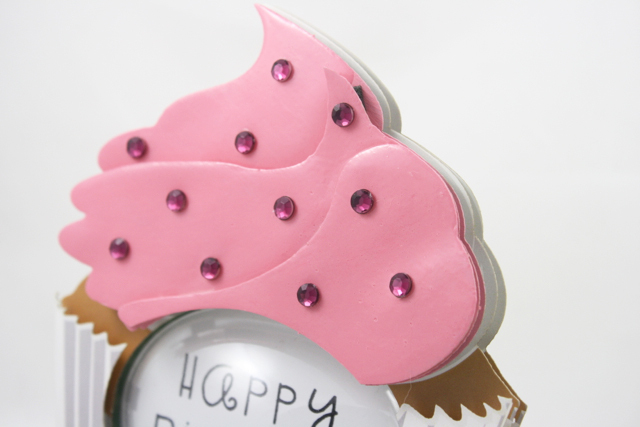 It would be a great addition to any birthday party table you create! I plan on using my dazzling cupcake as a tag for a birthday present. How fun would that be?!! 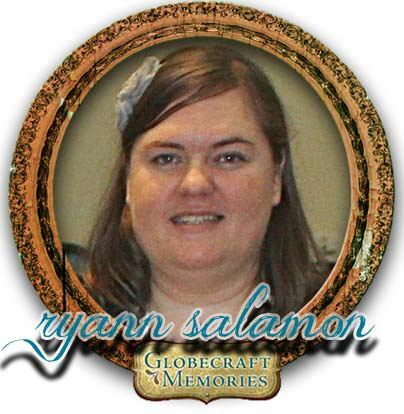 Globecraft Memories has some amazing ornaments available on our website now! They are a perfect addition to their other line of globe products. 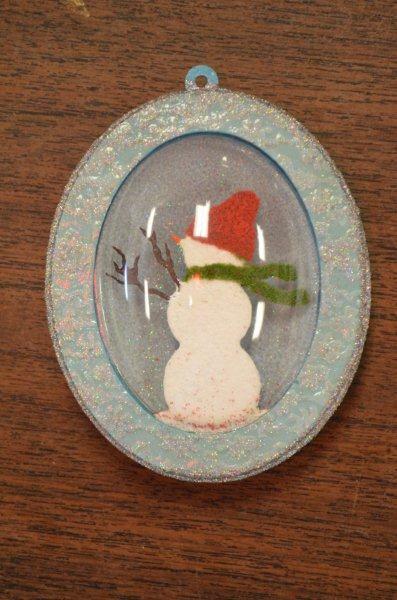 A bubble is attached to both sides of the frame so you have a wonderful 3 dimentional ornament. The ornament layers were covered with 3 layers of Enchanted Aubergine, heat setting between each layer. 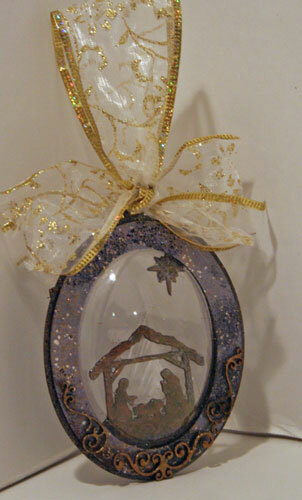 The nativity was covered with 2 layers of Mermaid Tears and then I placed several layers of Glastique on top. I used Vintage Holiday Flourishes Card Decor for the tiny elements along the bottom of the globe. 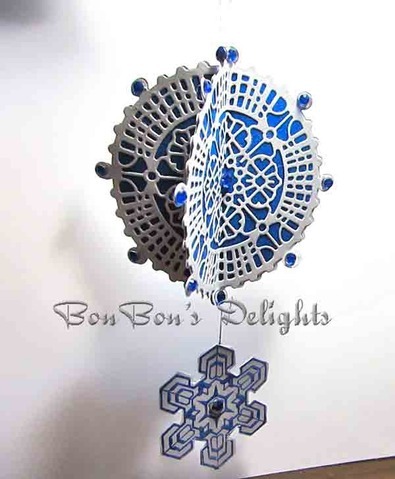 These Flourishes truly dress up the ornament. I added Mermaid Tears and then Gilded Rose powders to the Flourishes. A layer of Glastique was placed on top for a little more dimension. An elegant ribbon was added to the top. And you are now ready to hang in the tree. What do you get when you mix Piccolo magic with a wood shelf? Why, an absolutely gorgeous piece of home decor!!!! Globecraft Memories powders are truly remarkable and can cover larger items such as this shelf as easily as it covers smaller items. I have had this FAMILY shelf in my "stash" for a very long time. 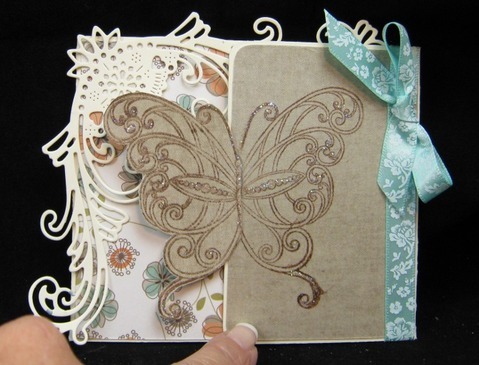 It has been waiting for just the perfect products to create something truly remarkable! Globecraft Memories to the rescue!! I inked the edges of the sign with Enamel Powder Adhesive, then added Brown Stone Powder. 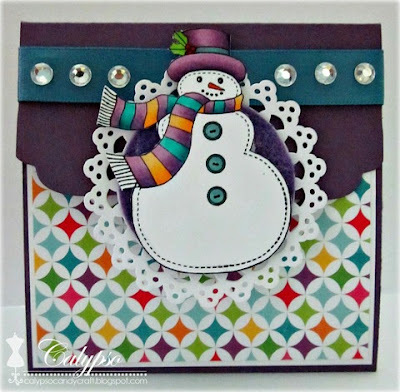 I love the look of the brown and white powders together. 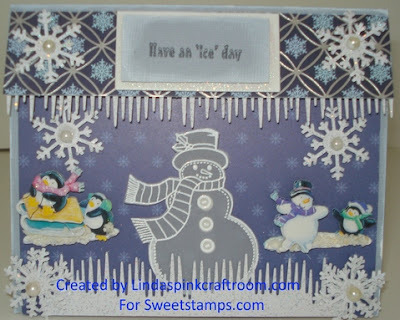 I also added a touch of Enchanted Aubergine along the edges - not too much, just a little to show the colors together. I inked up the individual FAMILY letters with Enchanted Aubergine. Since I wanted a thicker look to the colors, I heat set it several times between the Enchanted Aubergine layers. In areas where I was having trouble using the Adhesive bottle, I used a small paint brush and painted the adhesive. It worked great and allowed me to get into those tiny areas. I then added a touch of Brown Stone on each letter - just enough to let the color show. This is the final look at this home decor item. It is absolutely stunning and the perfect shelf to hold family mementos. Warm outside? With this recent heat wave we've been looking for ways to cool off around the office and Christmas in July is just the ticket! the rest of the elements. The chipboard elements were coated liberally with Glastique and then allowed to dry - the Glastique seals the elements and protects them from wear and tear. As a result, this ornament will last for years and years as a keepsake! 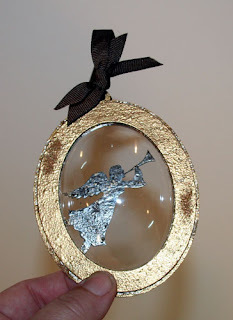 Designer Tip from Pat: If you use flocking on this ornament, make sure to shake off ALL excess flocking because otherwise any that falls off will stick to the inside of the clear bubble. Wouldn't this ornament be cute on a gift or as a hostess gift in its own right? 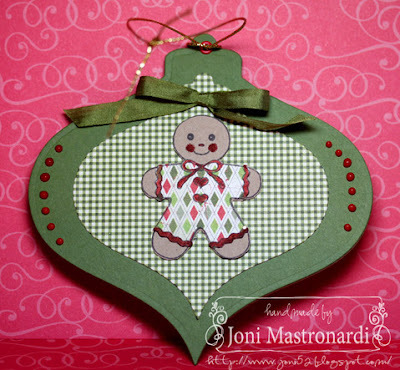 Cool off with a little crafting and get a head start on those holiday projects with our new ornaments. 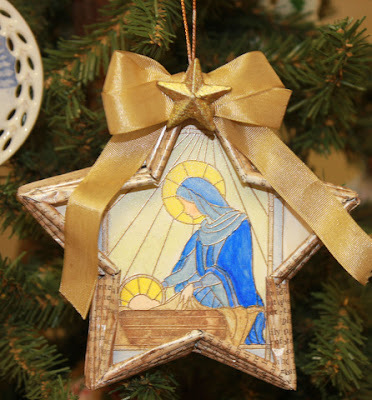 Who would you create this ornament for? Girls Night Out is so much fun! Good morning, Steph here. I thought I'd experiment with Girls Night Out and Glastique on some jewelry items. I used the Flower Drop Charm Set, adding at least 6 layers of Glastique to the charms, allowing time to dry between each coating. I found that the lighter you placed the Glastique, the faster each layer dried. 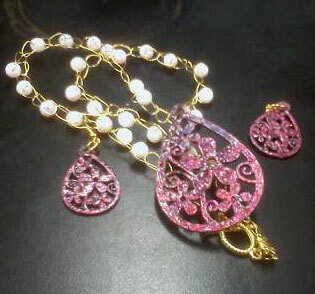 I crocheted the necklace with fine wire and added the beads while I crocheted. The focal point of the necklace remains the large teardrop charm which I also crocheted on the wire. Thanks for stopping by today and continue to come back for some more inspiration from the team. 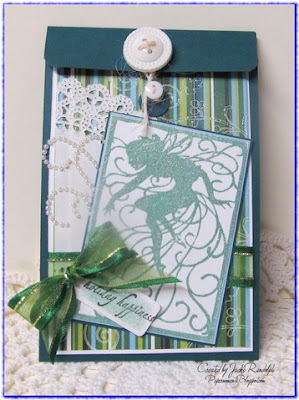 Here is a link to a tutorial for a flap card. We'd like to see what you create, so come join in the fun! 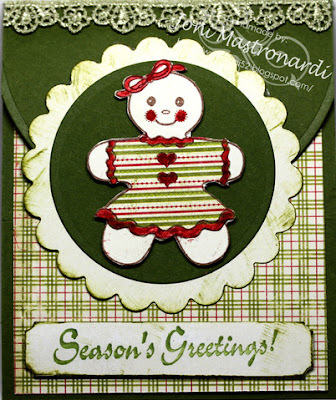 Remember to use a SweetStamps image on your creation to get an extra chance at winning $20 of rubber stamps from SweetStamps.com. Rules are listed in the sidebar and instructions can be found at the bottom of this post. We also have a SAVE THE BUS sale going on now...get 20% off everything in stock at our warehouse when you use coupon code BUMMER (we're liquidating some inventory to help pay for a new engine for the bus so we can continue to travel to trade shows to bring the latest products and techniques to a city near you!) See where we're headed next, we'd love to see YOU at a show! 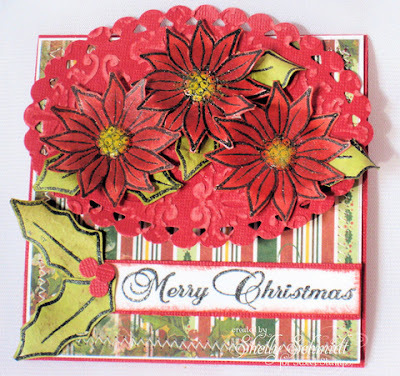 Next week we've got our final Christmas (in July) challenge, stop by to see what beautiful Christmas Ornaments the design team has created. 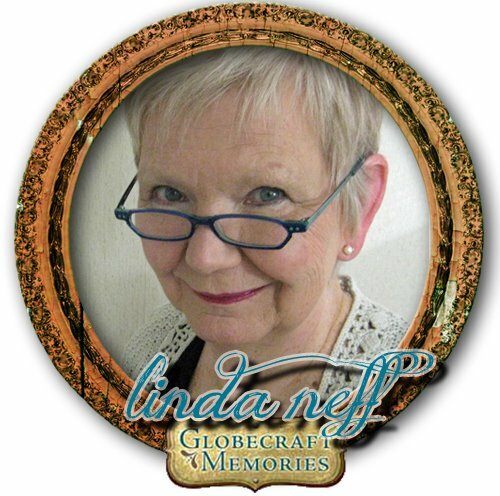 Globecraft Memories recently released a smaller size globe and frame system for ornaments. I am having so much fun with these! I have all sorts of ideas floating around in my head - just trying to find the time to play some more. 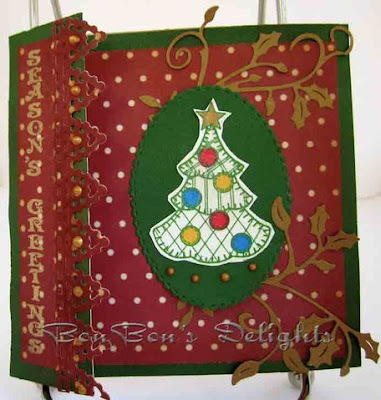 This is a little Christmas-themed ornament I created that was on display with an entire tree full of beautiful ornaments made by the design team at CHA recently. Everyone loved them! 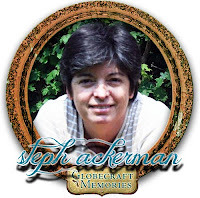 Paint a fairly thick layer of Glastique (Globecraft Memories) on the inside of the back bubble and sprinkle with Art Glitter Dazzlers Confection D29; tap out access and let dry. Cut out your favorite clip art (Crafty Secrets) and add bits of Art Glitters here and there for dimension and color. 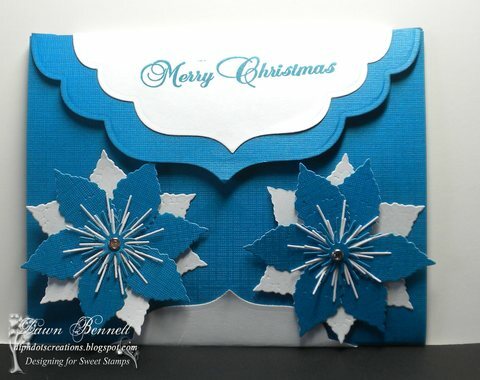 Dry emboss the two outer chipboard rings with an embossing folder. Paint the inner ring and top sides of the two outer rings with Pearl Adirondack Acrylic Paint Dabber (Ranger) making sure to paint inner and outer edges as well; set aside and let dry. 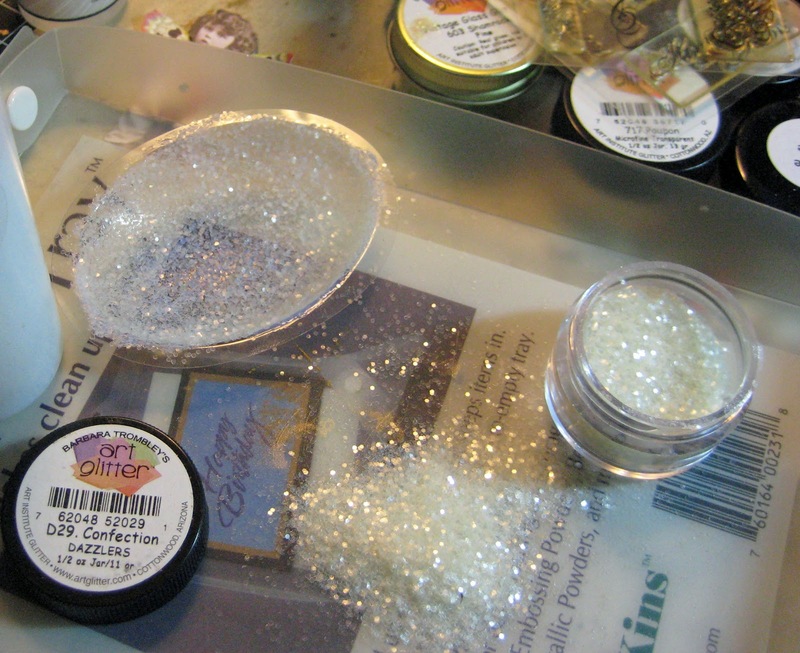 When dry, paint on a fairly thick coat of Glastique, and very lightly sprinkle on Pure Sprinkle Silver Glitter (Globecraft Memories) to both halves. Then coat both halves with a thick coat of Glastique (straight from the bottle) and let dry overnight. 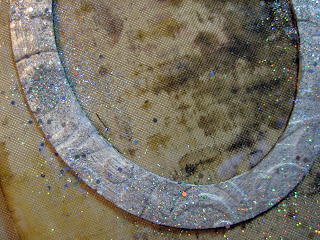 Begin to decorate inside the bubble by adding drops of Designer Dries Clear (DDC from Art Glitter) glue and press in pieces of moss; let dry. 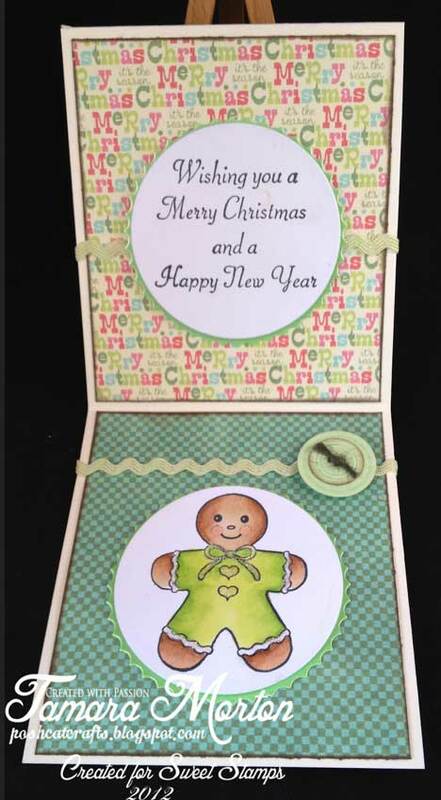 Trim the clip art down if necessary to fit inside the bubble. Add DDC glue to the back of the clip art and press lightly to adhere it to the moss. 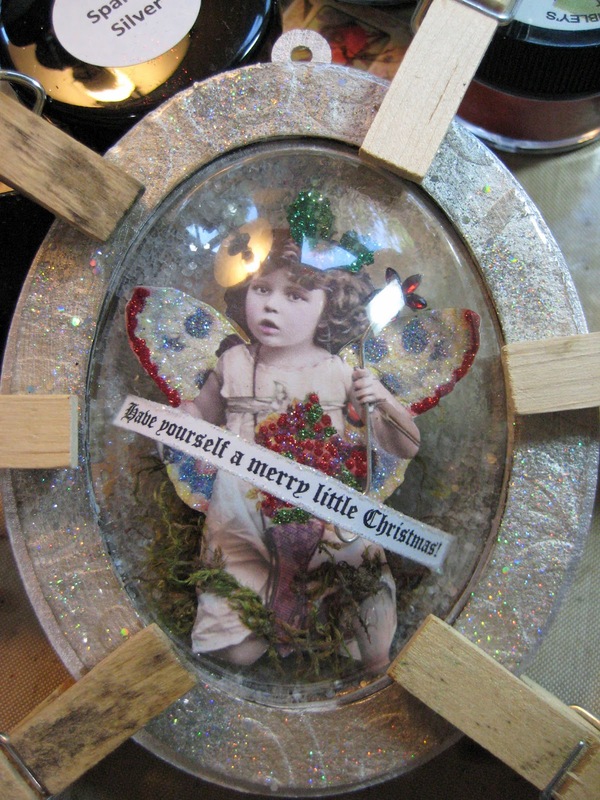 Trim a Christmas phrase (printed on the computer); add a very thin line of DDC to the edges of the phrase and dip into Winter White Microfine Transparent Art Glitter; repeat to coat bottom and both ends. 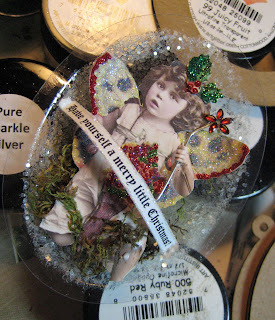 I like to roll the phrase around the glue bottle once the glitter has dried, to create a slight bend; add DDC to both ends and press into place inside bubble (should be slightly curved). The next day when the Glastique is cured: add a thin line of DDC to the flat rim of the filled bubble half; set the inner painted ring on top, making sure both pieces line up. Add a thin line of DDC to the top bubble rim and set atop the ring, making sure all pieces line up; clip with binder clips or clothespins for a few minutes till glue is set. Remove the clips after a few minutes. Add DDC close to the inner and outer edges of the bottom of Glastiqued frame; add to one side and line up. Repeat to other side; clip all pieces together, making sure they all line up. Remove after a few minutes. 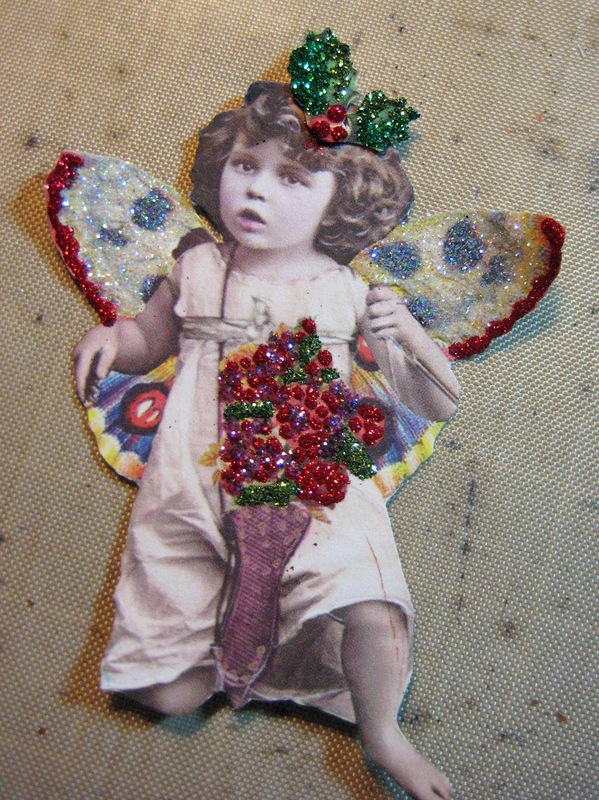 Pierce a hole in the bottom of frame, add jump rings and charm or crystal and add a beaded hangar to the top and tie with pretty ribbon. The possibilities for decking out these little globe ornaments are endless - have fun! 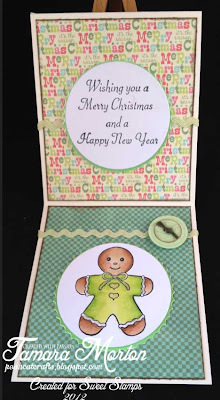 Piccolo- Not Just For Cards!